Do you love gifts? Would you rather give or receive? Gift giving and receiving has changed for me over the years. I remember being so excited about opening a box, unwrapping the gift paper, shaking a package to find out what is inside. But lately, the gifts that I appreciate the most have been the moments spent with those that I love, usually over food. (But I still do love the boxes, bows, gift paper, and what’s inside the package). Similar with gift giving. I cook. I feed. I gift the food. 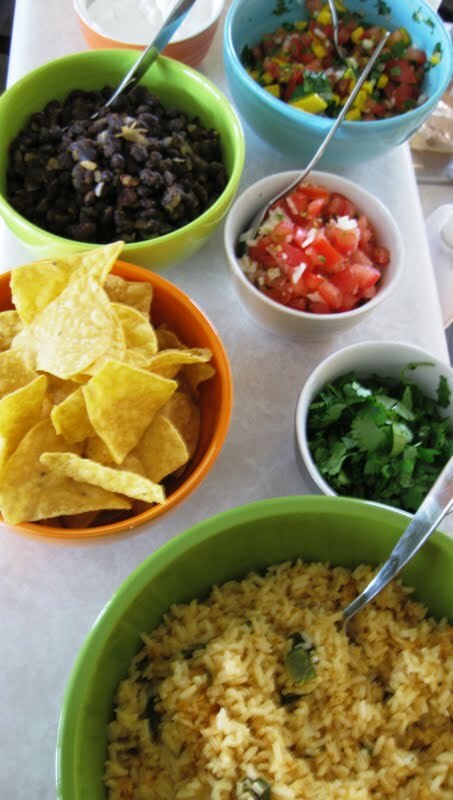 And so, as my mom’s birthday rolled around this year, I cooked a family dinner – Mexican Fiesta. I will skip the deliberation, discussion, compromising, contemplation and back-and-forth that went into making this dinner. At the end, we came together, enjoyed the meal and the company. And now I finish up washing the dishes and putting back my kitchen together, while thinking about what I will be cooking for Father’s Day this weekend. Guacamole – avocados, tomatoes, garlic, white onion, lime juice, jalapeno, salt & pepper. Salsa #1 – tomatoes, jalapeno, onion, lime juice, salt & pepper, seasoning blend. Salsa #2 – Salsa #1 plus mango and cilantro. Spanish Rice – poblano peppers, onion, garlic, tomato paste, rice, lime juice, salt & pepper. Chipotle braised chicken – chicken, onions, garlic, chicken broth, seasoning blend, lime juice. 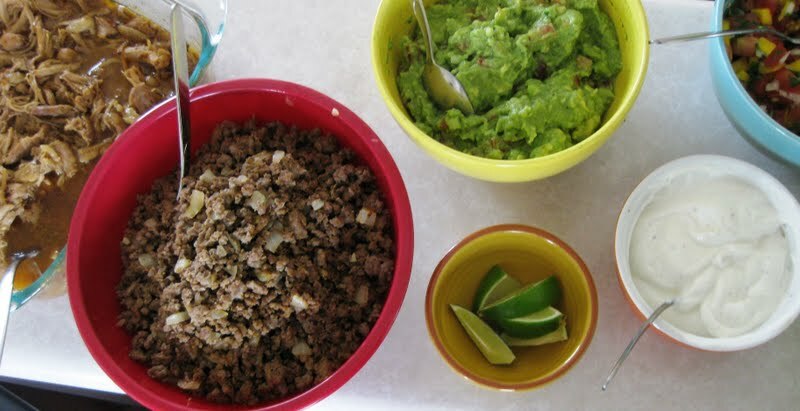 Ground beef – onions, garlic, beef, seasoning blend, lime juice. Chopped cilantro (apparently my Dad still doesn’t appreciate cilantro, so it needs to be on its own, not to contaminate anything else). 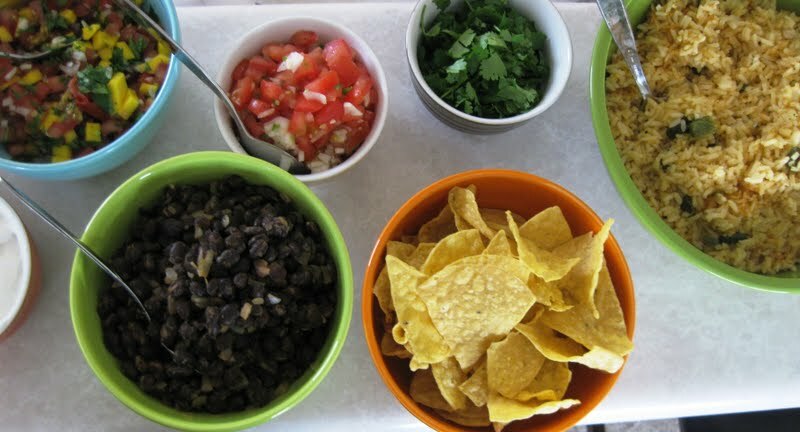 Black beans – beans, onion, lime juice, seasoning blend. Crema – sour cream, lime juice, seasoning blend, salt & pepper. Flour tortillas warmed on cast iron skillet. It’s quite possible that I’ve used every single bowl, plate, glass, pot and pan I have in my kitchen. But it was definitely, all well worth it! When’s the last time you cooked for someone? What was the occasion? What did you prepare? To answer your questions, because I know you're into "interaction with the audience" (and you just care in general, or maybe are just nosey…? ):Do you love gifts? yes. (including a fab green sweater i received for my birthday last year)Would you rather give or receive? receive, as i don't consider myself the best gift-giver.When's the last time you cooked for someone? Five days ago.What was the occasion? A thank-you meal.What did you prepare?Salade nicoise (variation with salmon and avocado).Also, I'm a scorpio and I love dogs, starry nights, and men with a good sense of humor.